Charlie Bears Horatio Discounts Apply ! From The New 2013 Plush Collection, Designed by Isabelle Lee. 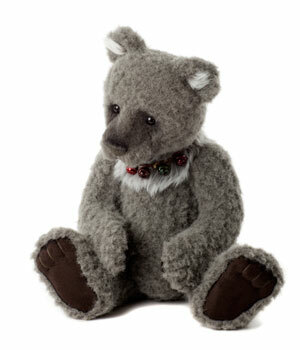 Horatio is a grey wool fur Plush Charlie bear . He has a hand stitched brown nose and black eyes has white inner ears and a ruff of whithunder his head . He wears a collar of bells around his neck. This beautiful Horatio is Fully jointed and hand finished and Surface Washable.